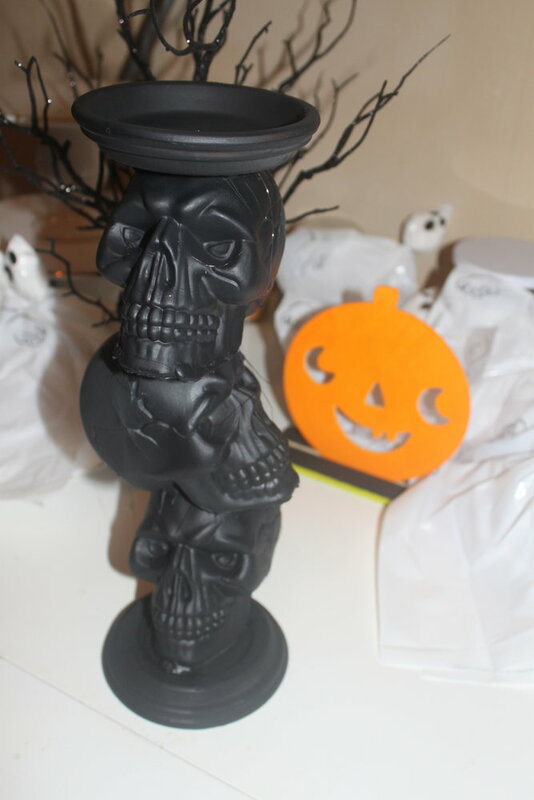 As All Hallow’s Eve approaches I am extremely excited about Halloween decorations! But man, they get pricey! So I did what comes natural to a crafter – found a way to decorate on budget. 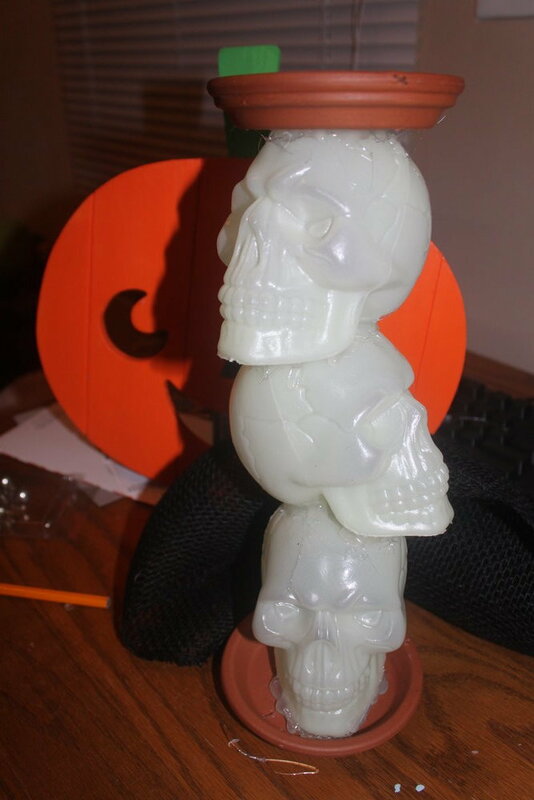 I will be showing you how I made this awesomely spooky skull candle holder. With some inexpensive supplies this do it yourself project is quick and easy to put together. Let’s get started! Terracotta plates – price will depend on the size you buy. Mine were less than $1 each because I got the smaller sized ones. Now that you have your supplies together, take the skulls and figure out how you would like them arranged. As you can see, I had the middle skull face a different direction than the other two skulls. Once you’ve figured out how you’d like to stack them, take one of the skulls and a terracotta plate and glue them together. (Please note: in the photo I had the terracotta plate right side up, I ended up pulling it off and flipping it over but I failed to take a new photo. The finished product photos show this change). Proceed to glue each skull together – followed by the second terracotta plate being glued right side up on top of the last skull. At this point, the project probably looks a bit odd, but don’t worry! The paint will make the project complete! Arrange the pieces how you’d like them and then glue everything together! One the glue is dry you can paint your project! I went outside with my project and a cardboard box I had been using for other painting projects and got to work. Because I was using spray paint I sat the project inside of the box and sprayed away! I would spray the side I could see and then back off for five or so minutes while it dried. I walked away between sprays to get away from the paint fumes. It took a about 20-30 minutes to get the entire thing coated evenly with paint. 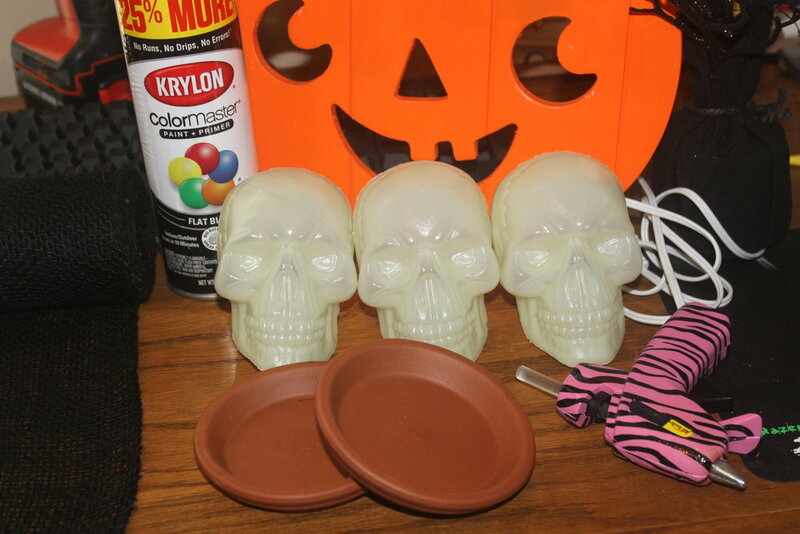 Once the paint is dried, you now have a spooky candle holder for your Halloween decor! Don’t have or use candles? No worries! I currently have a few cute trinkets sitting in mine! I just wouldn’t recommend using anything super heavy – a small candle or a few small, light trinkets would be best! Once you’ve finished the project I’d love to see how yours turned out! Tag me on Instagram @the_littlest_liar or on Twitter @thedancingdish! Don’t forget to use #LittlestLiarDIY and #IGGPPC! Sara (AKA thelittlestliar) is a lovely princess (at least in her head she is) who lives in South Carolina, USA. Her blog updates usually consist of Fandom or Geeky DIY projects or super yummy baking recipes. She has many passions which include crafts, DIY projects, baking, reading, drawing, and pretty nails. She dedicately watches Pretty Little Liars, The Fosters, and Scream Queens. Sara can be found on instagram @the_littlest_liar and on Twitter @thedancingdish.